Could it have been a boat trip in SKIPTON, NORTH YORKSHIRE ? Two or three years ago I took my young granddaughters on a one hour canal boat trip in Skipton. They enjoyed the music and dansed. A lady watched them, who I thought, might have been a professional dancer herself. I assumed it was a family member of an elderly gentleman who had his (90th?) birthday. Lord Bramall - Skipton - Morrisons - 'Balleten' - NATO - Moscow Institute of Space Medicine - Russians - etc. KGB = Mossad = Mafia. 1. Horrific scale of child abuse in the MILITARY MOB is still censored. I provided link to DUTCH report where the military, and not only politicians are involved. KGB=MOSSAD WOMEN are involved in 'providing' children. SEE: Pink and Blue Ballet in Belgium, etc. Are you STILL all right? 3. Podolsk Mil. Archive ? Not only Mil. Mob Medical? [ Friday, 5 August, 2016 ] - The scanner is "still broken". Military Spionage/Sabotage/Occupation and Mob-style Take-Overs. I wrote earlier that PM Theresa May ( as Minister of Interior) de-facto sabotaged investigation, prosecution (with a chance of accused spies to defend themselves) of Anna Chapman (maiden name Ukranian) and Garry McKinnon (whose father is Scottish). Did she create so-called PRECEDENT of an Asperge Sufferer being exemted from extradition because he "may commit suicide in prison"? Raphael Cohn, the son of Elaine and David Cohn is an Asperge sufferer. He was charged with abuse of his son Hans Cohn from his first marriage to Candeeza (sp?). Hans Cohn is severly autistic. Raphael Cohn and his parents were banned from seeing Hans without supervision by a social worker. [ Wed. 10 Aug.2016] - The link above has a page with classmate Fradkov. Directly under - Untu Fedor Ivanovich (?) - a military officer from Riga, who said he was busy in Moscow with MEDICAL research about VODNO-SOLEVOY obmen. De Brugh Conference?... . Is BOOMERANG on hotmail another virus of sorts? I did not 'click' on "plan your conference" offer, but it seems it is all over hotmail now. Cohn family: signs of links/attachments to CLINTONS.... . I noticed on Monday in Fareham market that peculier price signs are gone(?). [ thurs.11Aug.] - List of generals, ambassadors, etc. Post 172 this website 8 oct. 2008. [ Friday 12 August 2016] - Lingo Deception: words and phrases are made into jokes or filled with a lighter or different meaning, also placed into a different subject or discipline, sometimes unwittingly. 1. Under Influence - ref. to Hypnotism and its high-tech apps. Bewitching, etc. 2. Murphy Law (things going wrong) - the other side of Optimasation. Both good and Evil can be amplified or optimised. 3. Speedy Gonzales - people moving unnaturally fast, as if floating - was observed last a few days ago, when I wondered who "the mentor" of s-theater was - Gosport High Street, Morrisons. The Cabal freaked out (when I mentioned Untu F.I. and De Burght Conference ) and sent all types who are different from in appearance to deflect attention from themselves. SPORTS and OLYMPICS are de facto invalidated by the above and not only by doping or narcotics. Enough of Classical Physics, etc. to understand the ... unnatural attractions. More difficult to detect fraud if the object of attraction is ...attractive. The story has definitions of WEAK and STRONG influence/force/effect. [ Mon. 15 August, 2016] - I don't have last week's Times article (ref. Gen. Shirreff, etc.) by hand now. It was about Russia's miltary superiority versus Britain and alleged "secrets". I am not a military expert, but I almost laughed as I read it. Extraordinary drone acrobatics (one above another), but no mention of SPACE based weapons. Curious reference to Russia (officially Russian Federation: RF or RU) as RUS. RUS or Rus is the name Old Russia - Kievan Rus. I actually stated somewhere that Astronomy/Physics departments are de facto ground bases for space satellites and weapons: look at hardware-software-people there and what their research and findings stubbornly ignore. In Gosport Library a huge space is "office" space and top floor is out of bounds (key hole instead of a button in the lift). Ajacent building of Job Centre has huge top floor with "blind" windows. RUS ?... RUSI is Royal United Services Institute in London. FOUR services are "United" - Army, Navy, Air Force (RAF) and SPACE. When I first discovered RUSI website, the four services were there and there was ... a Russian face/name in the last department. Perhaps for my "benefit" ( the photo or overlay could have been fed into my file/online activity) the Russian face reminded me of a former neighbour (younger brother of my classmate Lida) Yura Chashkin. By the way, one daughter of Putin lives in Rotterdam, Holland in a spacious top flat or flats of a tall building. 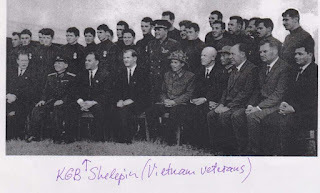 Group photo of VIETNAM veterans with KGB Shelepin sitting third from left (front row), official photo Dr. Natasha Kuhrt from War Studies Dept. 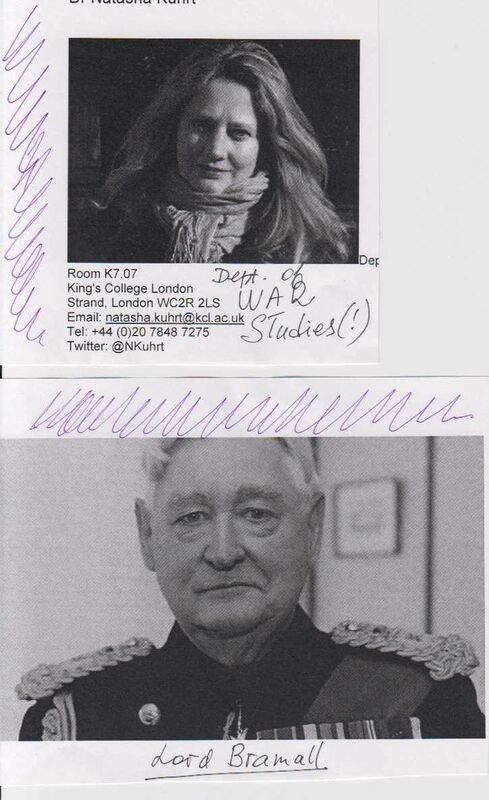 KCL and Lord Bramall. Second suspect e-mail sent to me from iPhone. From The News local paper today: "Golf club hits out at bank after cyber theft. NatWest (bank) refusesto reimburse nearly £90,000 stolen by hackers" by Danny Randon (danny.randon[at]the news.co.uk). "... the golf club had been negligent in not downloading the recommended security software." By the way, golf clubs own/lease a lot of land. The so-called Security Software Plus People is THE PROBLEM. What a shock to discover Leonid Timochouk is now an Intel Slave, completely "turned"(?). His CV online is probably ... automatically generated and 'edited'. I met his father in Delft. His Jewish aunt?... Pity I haven't met Natalia Abramovna, his mother, but perhaps she had said enough on the phone. I wonder if Timochouk family has links with Lydia Timashuk of Doctors' Plot (ref. Stalin's death). [ Mon. 22 August, 2016] - A page from Nat. Geographic is somewhere on this/other site with ZENITH Radio Corporation, International HQ - in Chicago, US. Sue, teacher of English as a Foreign language (Irish-Jewish-Communist) moved from Moscow BKC to Milan BKC in ...1999(?). [ Tue. 23 Aug. 2016] - Vladimir KARA-MURZA !..... What a rotten KGB=Mossad=MAFIA ploy. [ Wed. 24 August, 2016] - Ambassador Anat. Leonidovich ADAMISHIN, participant in De Burght Conf. on disarmament in Holland in 2002, was a Soviet Ambassador to ITALY in 1990-1992. He also worked in the Soviet Embassy in Italy in 1959-1965 (post not specified). Tunisian President (Bour....?) was an early proponent of reconciliation of Arab countries with ISRAEL. Fox and Sons estate agents must be "linked" to Fox Pub in Gosport, where be in 2005 a local man asked me to come and help him talk to his Ukranian girlfriend (visiting). The Ukranian woman was far too young (21?) to be a Bank Manager in Ukraine. Behaved strangely. The Pub was badly lit. MUST investigate who really owns flat 26 which I am renting from Christine KENNARD in Surrey. The Gosport Bourough (Benefits) official ( she looked a little like Linda Edwards in Civil/Voting section) I saw yesterday afternoon told me I must seek legal advice myself, they do not do checks. I received definitely FALSE e-mails (sent from a mobile) which contradicted standing contract and earlier e-mails from her. I wrote and posted a cheque ( crossed) for 207.70 pounds to Christine Kennard, which strangely upset young neighbour PAUL ( flat 21). Before leaving flat 24 (which was at one time linked to Football/Roman Abramovich), Phil enigmatically said he knew who owned flat 30 upstairs. A woman seen with Paul recently (Armenian?) tried to chat me up soon after I wrote to Natasha Kuhrt. She was brunette, but taller and different from an earlier ... parent or guardian, whom I referred to as "Mossad" a couple of years ago (Loeb in Chicago anniversary theatrics, which extended to Fareham and involved Paul. ). Paul has been a simple but pleasant young man untill the last few days. Highly controlled? Anna Chapman (maiden name Ukranian, etc.) worked in BARCLAYS Bank. Christine Kennard has acc. in Barclays. First acc. number she sent, as she apologized later had a mistaken digit. I decided to write a cheque. [ Friday 26 August, 2016] - Removed point (CK) but leave a mistaken Beest (Dutch for Beast) above. Yesterday in M&S (Ports.) I gave further details about incident by the cashier recently. I scanned and posted a receipt giving exact time (my post with photo of John Bull, I think). It was a quick sequence of my saying "Oh, no!" when a blond woman standing between two cashiers had asked: "Are you tempted?" seeing me looking for smth on the packet of figs and me feeling sudden pain in my solar plexus and chest. Figs came from ISRAEL. And a bit earlier in the same shop, a man behind me asked whot I was looking for, as he must have noticed I looked longer than what it takes to see the use by date. Nikita KHRUSCHEV: My vas pohoronim! ( we shall bury you) - perhaps was not a metaphora after all, whatever his own understanding of bio/chem/etc. weapons. May, 1973 - New President of ISRAEL is Prof. Ephraim Katchalski (57) - head of BioPhysics dept. of Weizmann Institute. Born in Kiev in 1916, emigrated to Palestine when he was 6yrs.old. LEONID TIMOCHOUK told me he was asked (by his parents?) to spend a day or afternoon with CRIMINALS or mafia (whichever word he used), which he resented. I discovered his online CV a couple of days ago (which gave me a severe shock) thinking he might be interested in answers I found to some problems he shared with me - ref. mathematical series and programming, Romanian woman at an IT conference, etc. The most unacceptable party, loud music, woman in late pregnancy, small child (baby), criminal looking guests from Southampton - all that was so bizarre, that I took pictures behind block of flats 21-32 of St. Matthews Court in Gosport. My conviction that there was a hidden agenda there, not just so-called criminality, was confirmed, when I saw in a local paper report of RUSSIAN SUBMARINE having passed English Coast that evening. MILITARY spionage, "laced" music, moblie phones, so-called apps, etc. Besides, there was an ethnic/cultural give-away. Not long ago Astronomy Dept. in Portsmouth Uni thought it fit to invite families with children (any age!) to watch stars in the middle of the night. Another idiocy: recent picture of nudists on top of a high-rise building. Effectively a (toxic) smoke screen for clandestine activities. SYRIA: Jebel DRUSE uprising in 1954. President Shishakli calls it Zionist/Imperialist plot. A Druse member of Israeli Parliament, Sheikh Jaber el Mo'Adi alleged on Feb. 1 that Syrian Army and Air Force "mercilessly" bombed Jebel Druse. On Feb. 25, 1954 Pres. Shishakli was overthrown by the military.